Imagine being the tiniest of all warm-blooded animals. Your entire body weighs less than two dimes. Some insects and worms even weigh more than you! When the air is cool, you must shiver or fly about to keep your body temperature up, and shivering or flying requires energy—lots of it! From the time you awake in the morning until you sleep at night, you are almost constantly doing one of three things: Eating high-energy food, quietly perching while you digest your food, or searching for new sources of food. You will need a small piece of modeling clay, a balance, a thermometer, and a refrigerator. Using your balance, get two chunks of clay, one weighing about 3 grams and one weighing about 90 grams. If you measure right, the small piece of clay will have about the same mass as a Ruby-throated Hummingbird, and the large one will have about the same mass as a Blue Jay. Poke your thermometer into the large piece of clay and hold it warmly in your hand or place it on a warm (NOT hot!) surface until the thermometer reads 80 degrees F (or about 26 degrees C). Now place the clay and thermometer in the refrigerator. Every minute, check the temperature and record it in your journal. How many minutes does it take for the clay's temperature to drop to 50 degrees F (10 degrees C)? Poke your thermometer into the tiny piece of clay, and hold this in your hand or put on a warm surface until it reaches 80 degrees F.
Put the clay in the refrigerator and check the temperature every minute, recording it in your notebook. How many minutes does it take for this piece of clay's temperature to drop to 50 degrees F (10 degrees C)? Your experiment should have shown that hummingbirds lose their body heat a lot faster than Blue Jays and other large birds. If they needed to keep their nighttime body temperature at even 90 degrees, over 10 degrees cooler than it usually is, they'd have to waste a lot of food energy and could starve overnight! If you needed to save energy in your house, you could turn the thermostat down at nighttime when people were sleeping. 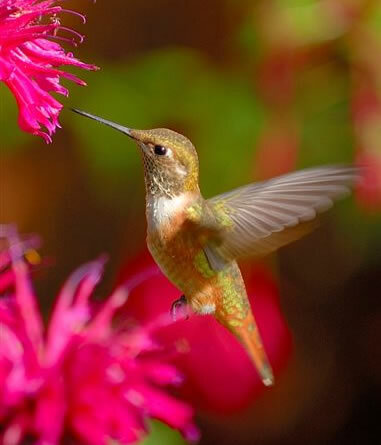 And hummingbirds do the same thing, thanks to a special adaptation. They don't have a thermostat, but they can allow their body temperature to drop sometimes more than 35 degrees F (20 degrees C) at night, from a daytime temperature of over 100 degrees F (over 37 degrees C)all the way down to 60 or 65 degrees F, so they won't need to burn nearly as many food calories to stay alive during the many hours they can't eat. This temporary drop in body temperature is called torpor. Humans normally die if our body temperature drops that low, because we are not adapted for torpor. 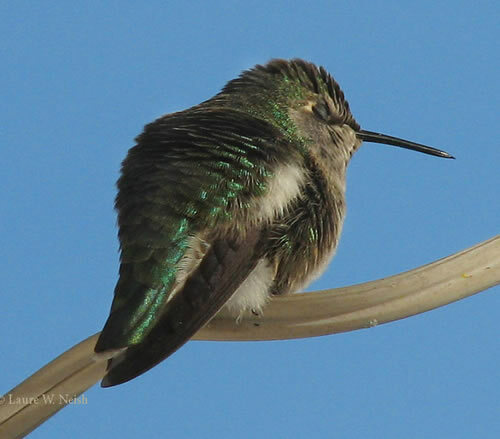 Dropping its temperature slows down a hummingbird's breathing and heart rate. One Blue-throated Hummingbird whose daytime, active heart beat 1260 times per minute had a heart rate when torpid all the way down at 36 beats per minute! The trickiest part of torpor isn't letting the body temperature fall at night, but getting it back up in the morning. A hummingbird has to warm up its body the moment it awakes. To do this, it makes its muscles contract and release very fast; it shivers! The problem is this: the hummer's stomach is empty and it must use up stored energy. When a hummingbird's body temperature is about 20 degrees C, it takes about an hour for it to warm up enough for normal activity. During this time, the bird is sluggish, groggy, and very hungry! As soon as it can, it flies off to eat breakfast. How can the hummingbird keep from falling off the branch during torpor? The feet get a good grip! Most perching birds have four toes on each foot with a claw at the end of each toe. When the hummer settles and bends its legs to perch, the stretched tendons of the lower leg flex the toes around the branch and clamp Hummer in place. This "perching reflex" is automatic. Why is a 3-gram chunk of clay so tiny compared to a hummingbird that weighs the exact same? Birds that undergo nighttime torpor are just about all very small. 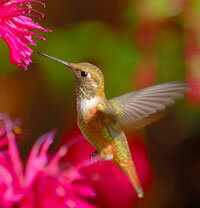 They include the tiniest birds of all, hummers, but also some chickadees and swifts. Why do you think no large birds undergo nighttime torpor? HINT: Think about the experiment with the clay. After you've written your explanations, see how they compare with Journey North Science Writer Laura Erickson's explanations.